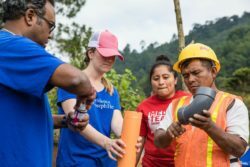 Medical Teams International is extending a multi-year partnership with Providence St. Joseph Health to continue serving remote communities in Guatemala. The partnership will help deliver life-changing health support for thousands of vulnerable Guatemalans. As part of the partnership, volunteer teams from Providence St. Joseph Health will serve 12 indigenous communities in the rural highlands and assist Medical Teams International’s Guatemala staff. The teams will renovate clinics, work on water catchment projects and build latrines. Additionally, teams of Providence doctors and nurses will train Guatemalan clinic workers. The agreement extends a partnership with Providence St. Joseph Health that originated in 2012. Over the past 6 years, dozens of teams have traveled to Guatemala to help struggling families stay healthy. Guatemala is the most populous country in Central America and the most impoverished. Nearly 60 percent of the population lives in poverty, subsisting on just $2 or less a day. In the rural highlands, far removed from urban environments, people lack access to health services. Clean water and sanitation are nonexistent, making poor health a chronic threat amid a veritable petri dish of diseases. Guatemala’s recent history is also marked by conflict and violence, the aftereffects of which continue to affect the country’s poorest people. The country’s 36-year civil war ended in 1996. But the human rights abuses perpetrated throughout that brutal campaign resulted in hundreds of thousands of deaths, with the majority being indigenous people of Maya descent. Rebounding from decades of marginalization has not been easy, especially in a country where just 6 percent of the limited gross domestic product is spent on health care. Children and pregnant mothers bear the brunt of the limited resources. Guatemala has some of the highest rates of malnutrition in the world, rivaling Sub-Sahara Africa. In parts of Guatemala, nearly 70 percent of children under the age of 5 are so malnourished that their growth is stunted. The work that will take place in the 12 new communities will focus primarily on women and children under 2, largely because they are the most vulnerable and excluded groups in Guatemala, especially for those living in rural and isolated communities. Medical Teams International and rural Guatemalans are immensely grateful for the partnership, which will bring lasting health to those who have lacked it for generations. Medical Teams International offers corporate partners a wide range of employee engagement opportunities.